Every experience is better when you get to share it with the ones you love. Our zipline tour is great for groups of people, so bring your friends and family with you when you come! 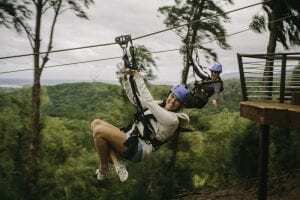 We have 8 side-by-side zipline runs, so you can see the North Shore’s famous beaches, farms, and lush mountains with the person of your choice right next to you. We’ll even take pictures of you along the tour so you have a reminder of what a great time you had together. Ziplining for the first time can be a little nerve-wracking, especially if you have a fear of heights. The best part about ziplining with us is that there is no need to be nervous! We have professional guides who accompany you on the tour and help make you feel safe. You will always be safely secured, and our guides take care of all the equipment transfers to hook you up to the zipline and other parts of the course. We also use the best in zipline braking, which eliminates riders having to “hand-brake.” You’re in good hands when you go ziplining in Oahu! Another tip while you’re ziplining is to be sure to take in the views! When you zipline with us at CLIMB Works Keana Farms, you are exploring one of the most beautiful places on Earth. 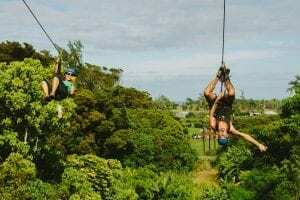 Our zipline tour offers panoramic views overlooking North Shore’s famous beaches, lush mountains, and picturesque farms. It allows you to see Oahu from a bird’s eye view! You’ll also have the opportunity to explore a working farm. Not only can you take in the views of the farm as you soar above it, but you can taste some of the fresh fruit! While you’re in Oahu, be sure to enjoy some of the other fun things to do! Some popular things to do include taking a helicopter tour and visiting the Polynesian Cultural Center. The Oahu Sunset Experience takes you on a full circle tour of Oahu when the colors of the sunset light up the sky. The Polynesian Cultural Center lets you explore the heritage of the Pacific Islands and is great for all ages. There is shopping, dining, and entertainment that combine for an experience you won’t forget! Follow these 4 tips when you go ziplining in Oahu, and you’re guaranteed to have the best time! Book your Oahu zipline tour today.